Habit: Shrub or tree < 30 m. Stem: twigs +- yellow or yellow-green or red-brown, velvety or soft-shaggy-hairy, glabrous in age, brittle at base or not; bud scale margins free, overlapping. Leaf: stipules generally leaf-like; petiole 4--10 mm, generally with glands; young leaves white-hairy; mature blade 67--130 mm, linear to narrowly elliptic, acuminate (base wedge-shaped), finely serrate, abaxial hairs generally minute, spreading, wavy, to 0. Inflorescence: blooming with leaves, pistillate 23--82 mm, on leafy shoots 2--48 mm (margins of shoot-leaves finely serrate); flower bract +- tan; pistillate bracts deciduous. Staminate Flower: stamens 4--6; nectaries adaxial, abaxial. 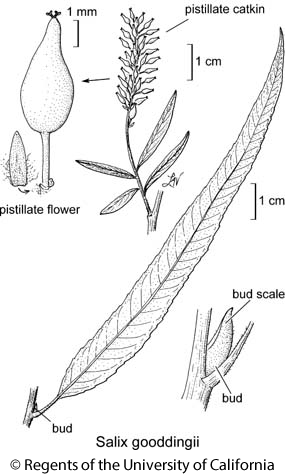 Pistillate Flower: ovary glabrous or hairy, stalk 1.2--3.2 mm, style 0.1--0.3 mm. Chromosomes: 2n=38. Citation for this treatment: George W. Argus 2012, Salix gooddingii, in Jepson Flora Project (eds.) Jepson eFlora, http://ucjeps.berkeley.edu/eflora/eflora_display.php?tid=42825, accessed on April 19, 2019. NCoRI, CaRF, SNF, GV, SCo, PR, GB, D (esp GV, D); Markers link to CCH specimen records. Yellow markers indicate records that may provide evidence for eFlora range revision or may have georeferencing or identification issues. Purple markers indicate specimens collected from a garden, greenhouse, or other non-wild location.